Long before the formal founding of Hovercraft Training Centers – and before the development of the ultra-modern HoverTrek™ we train with today – Neoteric Hovercraft, Inc. was making history. That longevity as the world’s original light hovercraft manufacturer is one of the reasons we use Neoteric craft exclusively. On this #TBT, let’s look back to a couple of Neoteric’s precursors to today’s HoverTrek™ - the Neova II and the LeMere. In the early 1980s, as their hovercraft were chosen to star in international television commercials, Neoteric was well on the way to the kind of fame they’ve earned today with Bubba’s Hover. Also check out this video of vintage Neoteric hovercraft featured in a 1983 commercial for Canada’s Labatt’s Beer … and enjoy a Photographic Half-Century History of Hovercraft Training Centers and the Neoteric training hovercraft. Essential even for a short commercial shoot, training has always been, and always will be, – the single most important factor for the successful operation of a hovercraft. And as the originator of the first successful light hovercraft, Neoteric and HTC founder Chris Fitzgerald has spent more than 50 years piloting, designing and developing hovercraft – and training those who fly them. Who better to be your instructor? See how a hovercraft can make it brighter: Take a Test Flight or Training Course! Think you can’t afford a hovercraft? Think again! The Neoteric Hovercraft Trade-In Showroom has just posted a Neoteric HoverTrek™ on sale at an incredible price. This training hovercraft, used only by us at Hovercraft Training Centers, is the perfect starter craft. It’s equipped with Neoteric’s patented reverse thrust system, comfortable side-by-side seating and a 65 horsepower, 2-cycle Hirth engine. Regularly serviced by Neoteric, we can guarantee it’s in perfect shape. You can own it for the bargain price of only $15,000 – and that includes a trailer! You don’t need jet skis, boats, canoes, kayaks, ATVs and snowmobiles in order to enjoy the outdoors year-round – a hovercraft replaces them all. 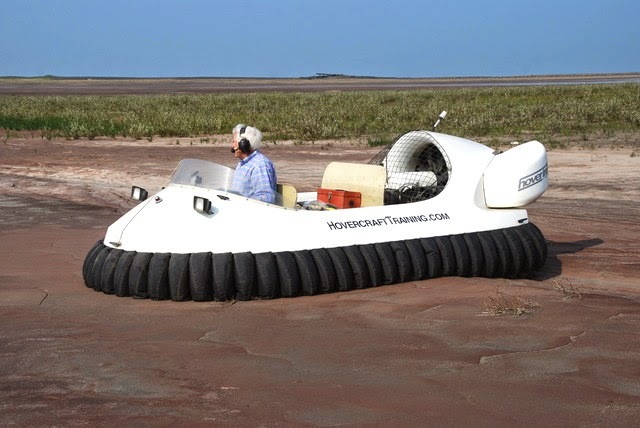 Whether you spend your leisure time on land, water, ice, snow, sand – or even mud – a hovercraft is the only vehicle that will fly you across any terrain, any time of the year. And hovercraft are not only safer and more fuel-efficient than boats, they’ll take you places that no other recreational vehicle can go. So, if you want to save a bundle of money and have fun year-round, contact Neoteric today because this craft is going to sell quickly!